Federal crimes are offenses that violate U.S. federal laws. They are prosecuted in federal courts by federal judges. 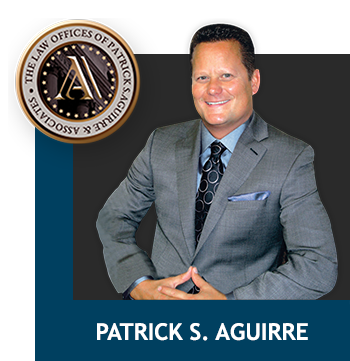 Call the Law Offices of Patrick Aguirre today for a Free Consultation. If you have been arrested for a DUI, you need to act quickly to give yourself the best possible chance of keeping your license and avoiding fines, jail time, and other potential penalties associated with DUI. Whether you have been accused of a crime, or injured in an accident, your future may hinge on the successful outcome of your case. It would be very stressful to have to go through the legal process on your own—but fortunately you don’t have to. Patrick S. Aguirre is here to stand up for your rights and interests, providing superior quality representation for personal injury and criminal defense matters in all of California. You can rely on Attorney Aguirre and his skilled legal team to provide compassionate guidance and complete legal assistance through every step of your case. We work diligently inside and outside the courtroom to make sure our clients receive the favorable resolutions they need to move forward with their lives. Remember, no case is too complicated for us and we often take cases other attorneys have refused. Words cannot express how tremendously grateful I am to Mr. Aguirre for his compassion and legal assistance during one of the most challenging times in my life. His level of expertise and professionalism surpassed even my greatest expectations. Aside from his obvious skill and remarkable success rate, Mr. Aguirre is genuinely committed to his clients. We could NOT have hired a better criminal defense lawyer for a family member. From the beginning to the end, Patrick and his professional office staff kept us informed on any updates, concluding the case with a dismissal! Patrick has since provided his services to friends of ours, upon our recommendation with the best outcome. Case dismissed pursuant to scerna motion. Charges dismissed pursuant to scerna motion. You can expect to see an intriguing collection of articles developing here, from how-to posts to lists of tips & tricks to more in-depth articles that will give you a better understanding of our business & service areas. We’ve collected some helpful client resource links on this page for your convenience. Remember, we are always here to answer questions so do not hesitate to ask if you need help finding additional information. If you would like to discuss your personal injury or criminal defense matter with an experienced attorney, just call our office at 800-572-1252 and Schedule your consultation. We are here 24 hour a day, 7 days a week to meet your needs.